The only way to cruise the magical Nile is on board the M/Y Alyssa, experiencing the unforgettable sights of Upper Egypt in comfort and style. Launched in early 2006, built in accordance with highest international specifications and classifications, the ship is 5 stars Deluxe Motor Yacht. 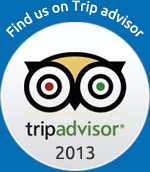 We include excursions where our Egyptologists whose vast experience and knowledge help bring Egypt alive. They will skillfully lead you through the exhilarating ancient Egyptian temples of Luxor, the Valley of the Kings and many more ancient Pharaonic sites. The boat was built according to the international specifications and a classification required by the Germanisher Lloyd, and was designed by renowned Swiss designer Pia Schmid who created a mixture of European, Egyptian and Nubian elements in the interior of the boat. These reflect in the surreal mood and feel of Alyssa and provides for an unforgettable cruise in lavish accommodation, with elegant dining and recreation areas. 66 ( 58 twin , 6 king bed , 2 deluxe suites) situated as follows: 04 Lower Deck,14 Main Deck, 22 Upper Main Deck 02 deluxe suites, and 24 cabins top executive deck..
Room Size: twin room 21 m2 approx, king room 21m2 approx, suite 31 m2 approx. Accommodation on Alyssa is on full board basis. » Doctor available 24 hours around the clock, Appointments or emergency calls half an hour in advance. Sir Livingstone lounge and bar created in unique African style that contains hand painted artifacts of Sir Livingstone’s journey on the Nile. A live pianist comprises the entertainment in the lounge, and plays anything from easy listening to Jazz and Blues. LED screens adorn the walls and project various data and entertainment and a dance floor welcomes those who feel the need to bust a move. Dining on board M/Y Alyssa is a unique experience. Our deluxe restaurant seats 135 people and serves local and international cuisines, offering both a la carte and open buffet. Smart casual dress code required. No jeans, shorts or slippers. Nothing beats basking in the sun on board Alyssa’s main sun deck. A plunge in the swimming pool followed by a soothing drink at the pool bar makes for a refreshing afternoon. For those who seek a little more privacy day beds are scattered throughout the deck, where one can lay back with the curtains drawn and enjoy the sights and sounds of the flowing Nile. On the second deck you will smell the enticing aromas of our Moroccan Cafe. On the third deck the Italian Terrace serves the finest Italian dishes and drinks. 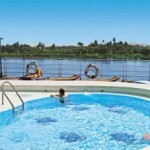 On board M/Y our PANORAMIC WELLNESS CENTER overlooks the Nile. 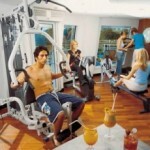 Situated on the fourth deck the Wellness Center is one of a kind and offers COMPLETE SPA FACILITIES including a MULTI PURPOSE GYMNASIUM, SAUNA, JACUZZI, MUDBATH and VITAMIN BAR. Our top notch licensed masseurs are always on call and available through appointments made in advance. 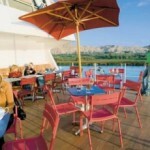 – Alyssa Nile Cruise could be totally chartered or Out of Service for Maintenance in some Dates. 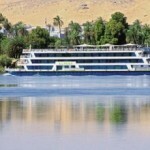 – The Alyssa Nile Cruise Could be Sold Exclusively for some Nationalities. So we have to check if it is available for your Nationality or not before confirming your booking.